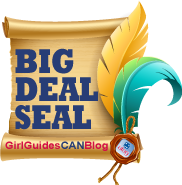 Update: This post was voted as a 2011/2012 GirlGuidesCANblog Big Deal Seal winner in the category “A Girl’s World”! Bravo blogger Amy! I’ve always loved Guiding and felt that it played an important role around the world. Moving to Iqaluit two years ago made its importance at home far more obvious. It’s easy for mainstream Canadians to think that girls in this country are fully equal to their male peers, but scratching the surface often reveals otherwise. Up here, there isn’t much scratching required. The black eyes I see daily are dead giveaways. Such is life as a Prosecutor in Nunavut, Canada’s newest territory, where the domestic violence rate is 13 times the Canadian average. That’s my day job; at night I volunteer with GGC. Don’t get me wrong; I love it here. I remember the thrill of stepping into Iqaluit’s bright yellow airport for the first time, feeling like I was in an alternate universe. Around me, women speaking Inuktitut carried their babies in their hoods, and a team of huskies waited outside. I still feel the same sense of excitement when I go for a hike in the 11 p.m. sunlight, gaze at the Everett Mountains from my window, or hear the local Brownies belt out a trilingual version of O Canada. Of course, plenty of things about Iqaluit are familiar. Like any other Canadian capital, it boasts a theatre, restaurants, coffee shops, radio stations, banks, and a library. The domestic violence is familiar to some extent too; it’s certainly not unique to Nunavut. It’s just that here — where communities are small, airfares are high, and there are no roads between towns — getting away from a bad situation is even harder than it is elsewhere. “This is why girls need Guides,” I think to myself whenever another young woman takes the witness stand and clams up, refusing to testify against the boyfriend who walloped her. 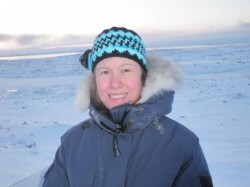 Despite the undeniable social problems, Nunavut is a beautiful and fascinating place. A few years ago I could barely pronounce the territory’s name. Now I can’t even think about moving away without getting misty-eyed. It’ll probably happen someday, but my memories of living, working and Guiding here will always be among my favourites – or at least most of them will be. This entry was posted in Girls' Guides and tagged violence. Bookmark the permalink. Keep up the good work, Amy! Awesome post! I completely agree with your statements as a fellow Pathfinder Guider in the North! The girls that are in my unit are strong and capable, but there are so many girls up here who are not. You’re a wonderful role model, Amy! I’m sure Guiding is making a difference. we need more professional women as leaders in guiding.. We make great role models for girls in many ways. And it’s good for us, as professional women to volunteer.